Conditional Fee Arrangements, After the Event Insurance and beyond! Download "Conditional Fee Arrangements, After the Event Insurance and beyond!" 2 defendant is funded by a CFA, it must file the Form N251 at Court when it files its first document at Court (eg the acknowledgment of service) and notify the other parties at the same time too. If the CFA is entered into after the claim has commenced, then the Form N251 must be filed and served as soon as possible and, in any event, within 7 days of the CFA being entered into. Although a party is obliged to provide information about a CFA once a claim has been issued, the rules are not as rigid prior to the issue of a claim; they simply state that a party that has entered into a CFA prior to the issue of a claim should as soon as possible, notify the other parties to the dispute that it has done so How is it calculated? The success fee represents the risk to the legal representative of the client losing the claim and therefore the possibility of not ever receiving full payment and suffering a delay in payment of a full fee. It is up to the legal representative to set the success fee depending upon his/her assessment of the risk. However, the success fee must not exceed 100% of the legal representative s ordinary fees Disclosure of the success fee A party is not obliged to disclose the level of success fee in its CFA until after a final costs order. It is not obliged to do so as, due to the way the fee is calculated (see above), it can give away what a party and its legal representatives consider to be its prospects of success and therefore put it at a tactical disadvantage. Before making an offer of settlement which incorporates an offer to pay the other side s costs, a party to a dispute (the offeror) may want to know what the receiving party s costs will (or at least are likely to) be. However, the party with the CFA is under no obligation to provide details of the success fee. Instead, it can just inform the offeror what its ordinary costs are and remind them that there will be a success fee in addition. Alternatively, the party with the CFA could provide the offeror with a global figure including the success fee. If they do not provide a global figure, the party making the offer will want to err on the side of caution and proceed on the worst case scenario, namely that the maximum success fee of 100% will be applicable When is the success fee payable? 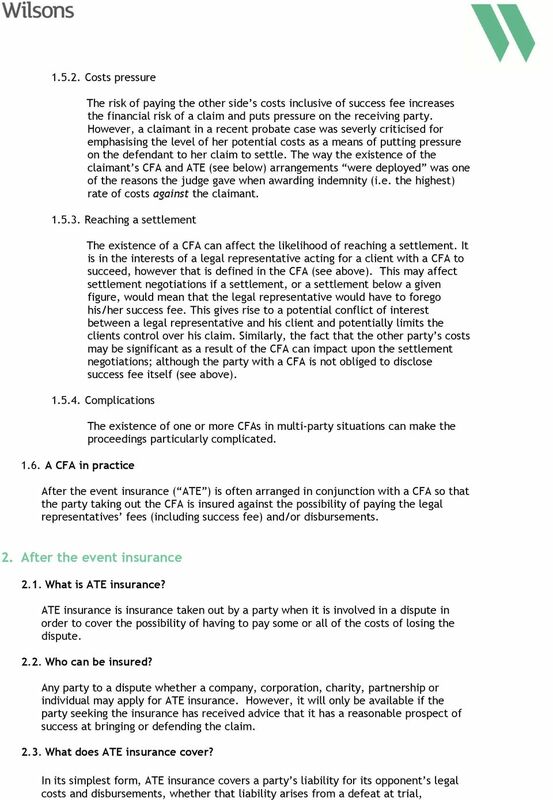 The event(s) upon which the success fee will become due will be defined in the CFA. The definition of success can include results achieved by settlement, regardless of how low the settlement sum may be. This is, therefore, a critical term of the agreement Who pays the success fee? If a party with a CFA wins the claim, the other party is likely to be ordered to pay the winnings party s costs. In theory, these costs can include all fees payable under a CFA including any success fee, although in practice the costs will be subject to the usual tests of reasonableness and proportionality. 3 Note that whilst the fees payable under a CFA including any success fee should be recoverable from the losing party, this is only of comfort if the losing party can afford to pay them. If not, the winning party will end up paying higher costs than it would otherwise have done, given that costs under a CFA are usually significantly higher than costs when the legal representative is not acting under CFA Can the success fee be challenged? The success fee can be challenged. Grounds for challenge include: i ii Failure to provide the paying party with the requisite information (see notification requirements above). The level of the success fee. The judge assessing costs will consider the facts and circumstances as they were known to the legal representative when the CFA was entered into, in order to decide if it was set at a reasonable level. If he thinks not, he can reduce the success fee on assessment. Factors that will be considered include the risk that the circumstances in which the costs, fees or expenses would be payable might/might not occur and the legal representatives liability to any disbursements. 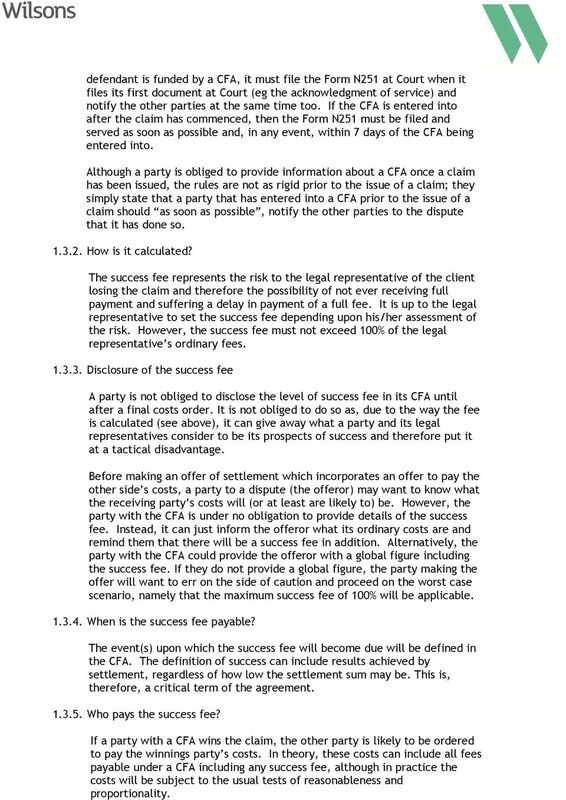 Note that when it comes to the stage of assessing the success fee, the party with the CFA has to provide a statement of reasons explaining the percentage uplift applied (i.e. the success fee). 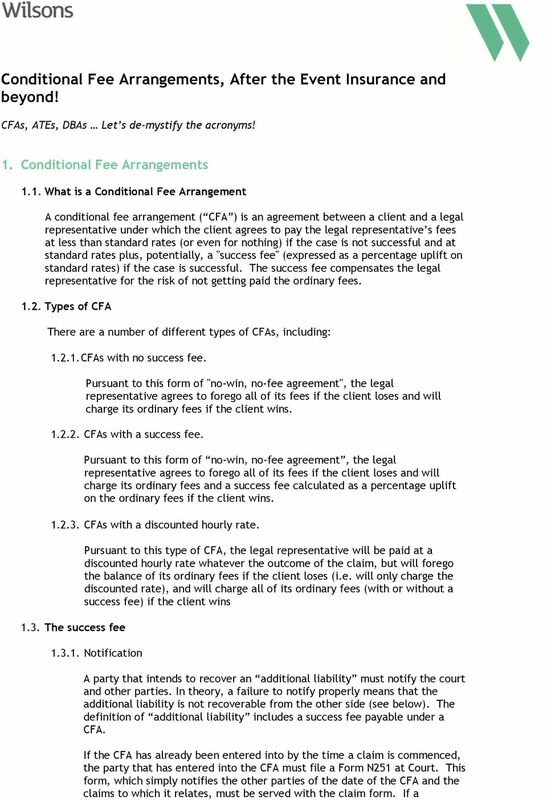 There is a significant amount of case law and academic debate on whether or not a CFA itself is disclosable once a costs order/agreement has been made, which there is not time to go into here A CFA in practice Brief terms of an example CFA: The client is to pay 50% of the legal representative s normal hourly rate ( 250) during the course of the claim i.e. 125/hour during the claim, with the remaining 50% only becoming due if the client wins the claim along with a success fee (also known as the uplift ) of 100%. The legal representative does 200 hours of work. i ii If the client loses, then it will have paid 200 x 125 = 25,000 and nothing more will be due. If the client wins, then it will be obliged to pay the remaining 125/hour ( 25,000) plus a success fee of 250 x 200 hours ( 50,000). The client s costs will be 75,000. However, these costs may be recoverable if the party obtains a costs order in its favour. 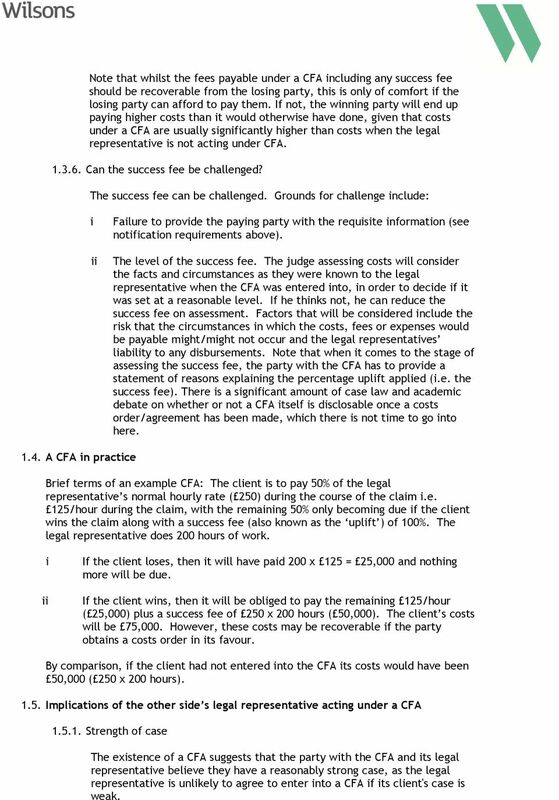 By comparison, if the client had not entered into the CFA its costs would have been 50,000 ( 250 x 200 hours) Implications of the other side s legal representative acting under a CFA Strength of case The existence of a CFA suggests that the party with the CFA and its legal representative believe they have a reasonably strong case, as the legal representative is unlikely to agree to enter into a CFA if its client's case is weak. 5 discontinuance, or some other outcome, such as the failure to do better in the judgment than a settlement offer made before the judgment. Most parties also opt to insure their own disbursements (e.g. court fees), including Counsel s fees. Costs incurred before the policy is taken out can also be covered. However, it is important to note that ATE insurance will not cover the parties disbursements on an interim basis, but only at the conclusion of the claim in the event of an unsuccessful outcome. The policy may also insure the party against the costs of the ATE premium. Some insurers will offer a policy which covers both sides costs should the case be unsuccessful. 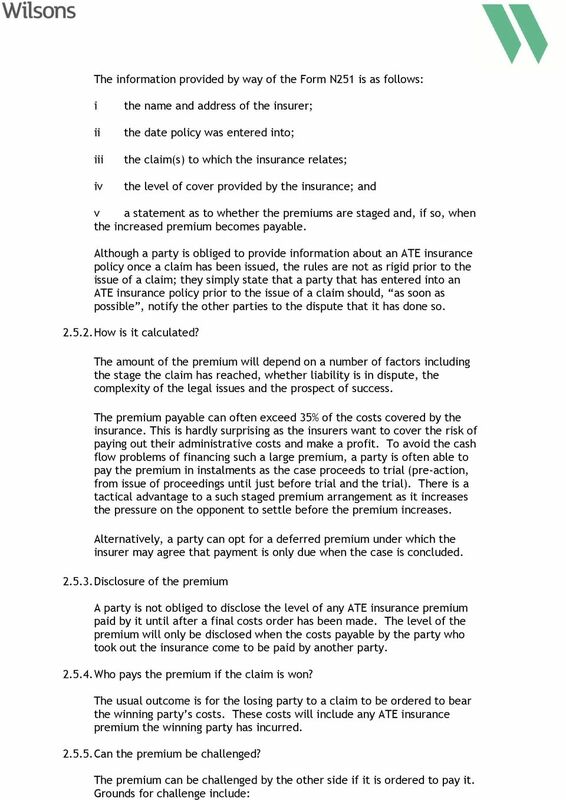 The costs of the premium under such policies is much higher since the insurer is shouldering all the risk (as opposed, for example, to the party s legal representatives shouldering some of the risk via a CFA which does not require payment of the legal representative s fees upon losing the claim). 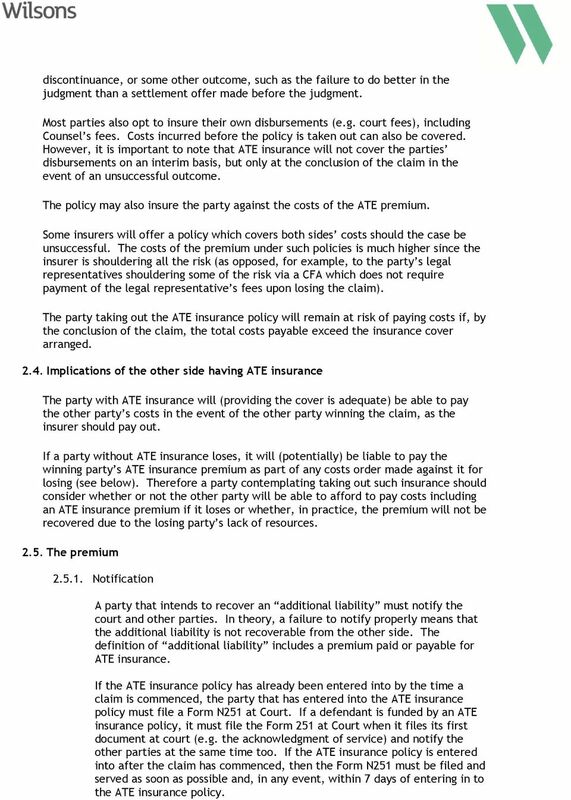 The party taking out the ATE insurance policy will remain at risk of paying costs if, by the conclusion of the claim, the total costs payable exceed the insurance cover arranged Implications of the other side having ATE insurance The party with ATE insurance will (providing the cover is adequate) be able to pay the other party s costs in the event of the other party winning the claim, as the insurer should pay out. 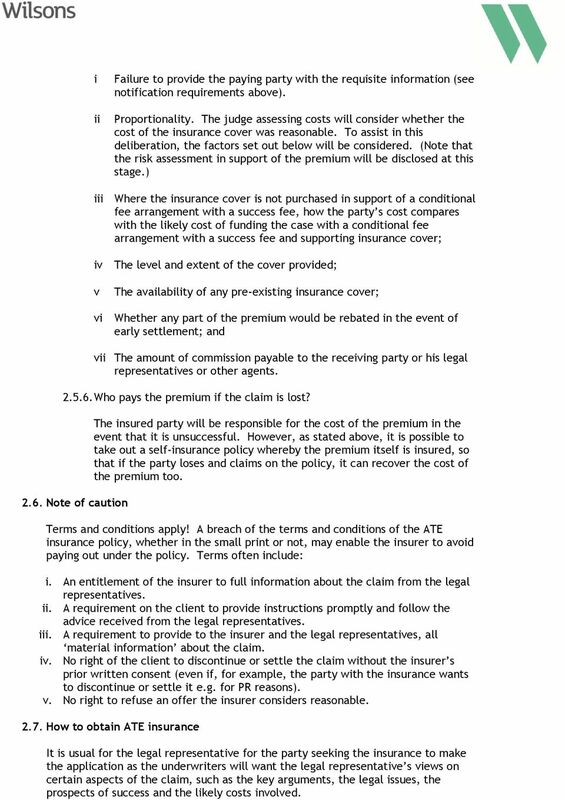 If a party without ATE insurance loses, it will (potentially) be liable to pay the winning party s ATE insurance premium as part of any costs order made against it for losing (see below). Therefore a party contemplating taking out such insurance should consider whether or not the other party will be able to afford to pay costs including an ATE insurance premium if it loses or whether, in practice, the premium will not be recovered due to the losing party s lack of resources The premium Notification A party that intends to recover an additional liability must notify the court and other parties. In theory, a failure to notify properly means that the additional liability is not recoverable from the other side. The definition of additional liability includes a premium paid or payable for ATE insurance. If the ATE insurance policy has already been entered into by the time a claim is commenced, the party that has entered into the ATE insurance policy must file a Form N251 at Court. If a defendant is funded by an ATE insurance policy, it must file the Form 251 at Court when it files its first document at court (e.g. the acknowledgment of service) and notify the other parties at the same time too. If the ATE insurance policy is entered into after the claim has commenced, then the Form N251 must be filed and served as soon as possible and, in any event, within 7 days of entering in to the ATE insurance policy. 7 i ii iii iv v vi Failure to provide the paying party with the requisite information (see notification requirements above). Proportionality. The judge assessing costs will consider whether the cost of the insurance cover was reasonable. To assist in this deliberation, the factors set out below will be considered. (Note that the risk assessment in support of the premium will be disclosed at this stage.) Where the insurance cover is not purchased in support of a conditional fee arrangement with a success fee, how the party s cost compares with the likely cost of funding the case with a conditional fee arrangement with a success fee and supporting insurance cover; The level and extent of the cover provided; The availability of any pre-existing insurance cover; Whether any part of the premium would be rebated in the event of early settlement; and vii The amount of commission payable to the receiving party or his legal representatives or other agents Who pays the premium if the claim is lost? 2.6. Note of caution The insured party will be responsible for the cost of the premium in the event that it is unsuccessful. However, as stated above, it is possible to take out a self-insurance policy whereby the premium itself is insured, so that if the party loses and claims on the policy, it can recover the cost of the premium too. Terms and conditions apply! A breach of the terms and conditions of the ATE insurance policy, whether in the small print or not, may enable the insurer to avoid paying out under the policy. Terms often include: i. An entitlement of the insurer to full information about the claim from the legal representatives. ii. A requirement on the client to provide instructions promptly and follow the advice received from the legal representatives. iii. A requirement to provide to the insurer and the legal representatives, all material information about the claim. iv. No right of the client to discontinue or settle the claim without the insurer s prior written consent (even if, for example, the party with the insurance wants to discontinue or settle it e.g. for PR reasons). v. No right to refuse an offer the insurer considers reasonable How to obtain ATE insurance It is usual for the legal representative for the party seeking the insurance to make the application as the underwriters will want the legal representative s views on certain aspects of the claim, such as the key arguments, the legal issues, the prospects of success and the likely costs involved. 8 3. The future 3.1. Good news! 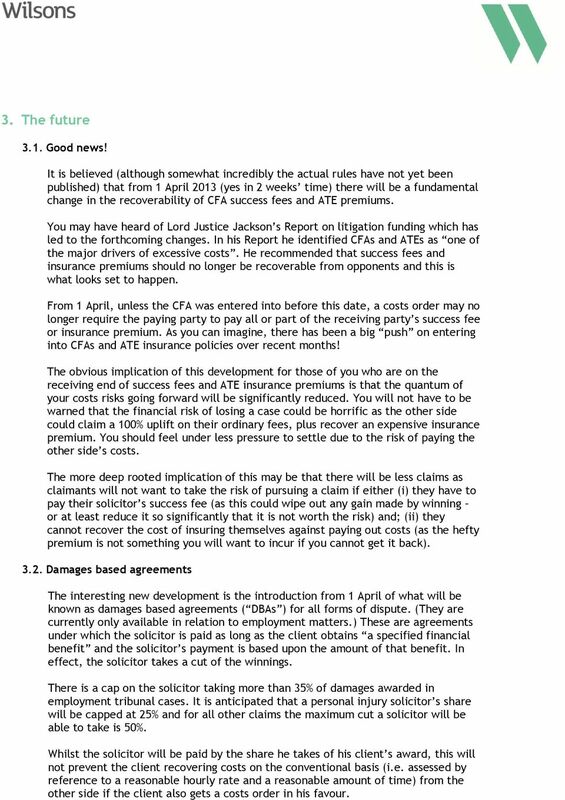 It is believed (although somewhat incredibly the actual rules have not yet been published) that from 1 April 2013 (yes in 2 weeks time) there will be a fundamental change in the recoverability of CFA success fees and ATE premiums. You may have heard of Lord Justice Jackson s Report on litigation funding which has led to the forthcoming changes. In his Report he identified CFAs and ATEs as one of the major drivers of excessive costs. He recommended that success fees and insurance premiums should no longer be recoverable from opponents and this is what looks set to happen. From 1 April, unless the CFA was entered into before this date, a costs order may no longer require the paying party to pay all or part of the receiving party s success fee or insurance premium. As you can imagine, there has been a big push on entering into CFAs and ATE insurance policies over recent months! The obvious implication of this development for those of you who are on the receiving end of success fees and ATE insurance premiums is that the quantum of your costs risks going forward will be significantly reduced. You will not have to be warned that the financial risk of losing a case could be horrific as the other side could claim a 100% uplift on their ordinary fees, plus recover an expensive insurance premium. You should feel under less pressure to settle due to the risk of paying the other side s costs. 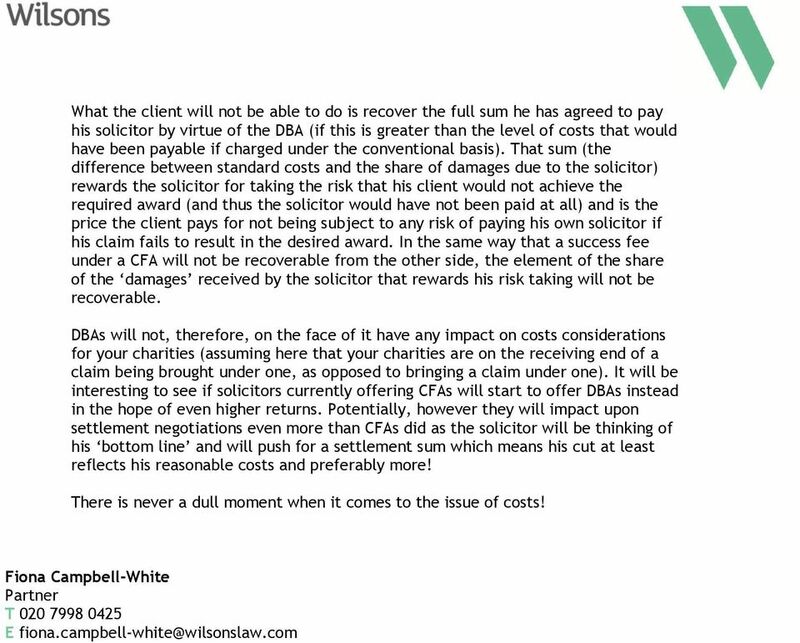 The more deep rooted implication of this may be that there will be less claims as claimants will not want to take the risk of pursuing a claim if either (i) they have to pay their solicitor s success fee (as this could wipe out any gain made by winning or at least reduce it so significantly that it is not worth the risk) and; (ii) they cannot recover the cost of insuring themselves against paying out costs (as the hefty premium is not something you will want to incur if you cannot get it back) Damages based agreements The interesting new development is the introduction from 1 April of what will be known as damages based agreements ( DBAs ) for all forms of dispute. (They are currently only available in relation to employment matters.) These are agreements under which the solicitor is paid as long as the client obtains a specified financial benefit and the solicitor s payment is based upon the amount of that benefit. In effect, the solicitor takes a cut of the winnings. There is a cap on the solicitor taking more than 35% of damages awarded in employment tribunal cases. It is anticipated that a personal injury solicitor s share will be capped at 25% and for all other claims the maximum cut a solicitor will be able to take is 50%. Whilst the solicitor will be paid by the share he takes of his client s award, this will not prevent the client recovering costs on the conventional basis (i.e. assessed by reference to a reasonable hourly rate and a reasonable amount of time) from the other side if the client also gets a costs order in his favour. DAMAGES BASED AGREEMENTS AND CONTINGENCY FEES Colm Barry Both CFAs and DBAs are a type of contingency fee. Contingency fees generally are unlawful for contentious business except where permitted by statute. DBA Regulations I have considered the Damages Based Agreements Regulations and the manner in which they may be re written for the purposes of including DBA's for all claims over and above employment matters. questions fees payable under the new process? Frequently asked questions Low Value Personal Injury Claims in Road Traffic Accidents Stage 3 Q72. Will paper hearings be allowed for child claims? A72. No. All child claims will require an oral hearing. Implementation of the Jackson Reforms. The key changes. The Impact of the Jackson Reforms on Costs and Case Management Civil Justice Council Conference 21 st March 2014 Written Submission of the Law Society The Law Society 2014 Page 1 of 9 2014 The Law Society. Legal Watch: Personal Injury 2nd July 2014 Issue: 025 Part 36 As can be seen from the case of Supergroup Plc v Justenough Software Corp Inc [Lawtel 30/06/2014] Part 36 is still the subject of varying interpretations. Group Actions Leaflet. This leaflet is designed to explain to Claimants in clear terms the rules about costs in group actions (sometimes called class actions or multi-party actions ). What is a Group Action?